Easy and reliable proofing with the complete solution for the toughest quality demands! 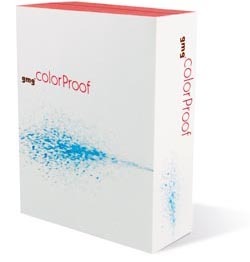 In recent years, the multiple award winning proofing software GMG ColorProof established itself in many countries as the most professional software solution for producing digital contract proofs. The core element is the 4-D color-transformation engine that assures the highest possible quality and production reliability. The GMG ProofStandard and CalibrationSet Technology avoids the output of faulty proofing jobs on printers or papers that are incapable of reproducing specific printing standards. Since version 5.1, GMG ColorProof incorporates the new platform technology of GMG which enables the support of all current and future proofing printer generations. Since version 5.2, GMG ColorProof features the new GMG ProofControl Inline module for fully automated proof verification for the new Epson Stylus Pro 4900, 7890, 9890 as well as the 7900 and 9900 proof printers with an integrated measuring device. The latest Adobe PDF Print Engine 2.5 Technology helps to achieve identical color output as any Adobe-based RIP. The most accurate compatibility with Adobe Creative Suite 5 is guaranteed. GMG ColorProof supports all standard spot color systems and is compatible with standard ICC profiles that can be combined with GMG profiles. For Remote Proofing, complete proofing jobs including all settings can be exported and imported in order to achieve the same results at both the creator's end and the remote site. With a correctly calibrated and profiled monitor, GMG ColorProof can provide viewing of jobs as soft proof. Load Balancing, i.e. automatic splitting of proof jobs over free printers, maximizes productivity due to optimum capacity utilization. Filter rules enable automated production allowing various workflows with different processing steps to be assigned to one hotfolder - GMG ColorProof automatically handles the correct further processing. Various nesting-functions lead to a significantly higher degree of automation and to higher efficiency. All functionalities of GMG ColorProof are correspondingly implemented in GMG DotProof and GMG FlexoProof. Note: Although GMG ColorProof works with any media, it consistently produces the highest quality results when used with proofing-specific GMG media, manufactured to high tolerances specifically for color critical applications.